McALLEN — The road back to the state tournament began Thursday night for the Bulldogs on their home turf, and they wasted little time going to work. Junior Ava Alaniz led McAllen High with a hat-trick as the Bulldogs scored three goals in each half on their way to a 6-1 Class 6A bi-district victory over Laredo LBJ at McAllen Veterans Memorial Stadium. Alaniz weaved her way through and around multiple Laredo LBJ defenders for two of her goals, and Miranda Munoz found her for another to give her three on the night. The Bulldogs kept the pressure on the Laredo LBJ defense from the opening minute, peppering the Wolves’ keeper with shots. During the seventh minute, the levees finally broke. Sophia Soto notched the game’s first goal by outrunning her defender around the left side into the box for one score, and she went on to add another during the second half by striking a laser that was assisted by Munoz. McAllen High coach Patrick Arney said he noticed Laredo LBJ was susceptible to the dribble, and it showed on Thursday. “That constant pressure is just hoping they’re going to make a mistake and you saw that tonight, here and there. The good individual talent that we have came through tonight. Ava had some great goals. Sophia had some good goals. We did some really nice things, so I’m really proud of the girls,” Arney said. Senior Emily Gurwitz played a pivotal role on the defensive end as the Bulldogs back line denied the Wolves attack over and over again, surrendering just one goal right before the break. 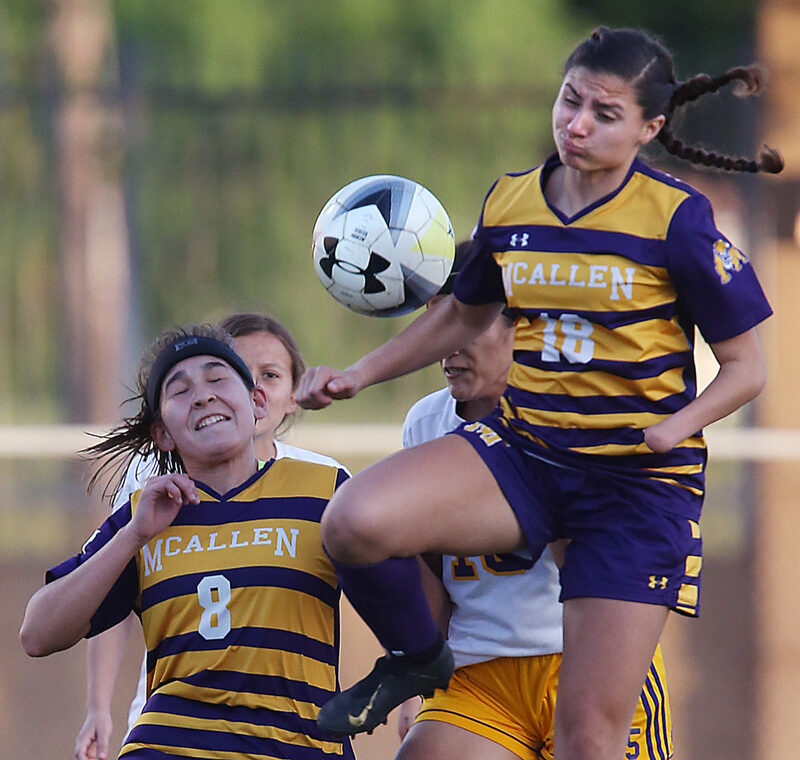 Gurwitz knocked in a penalty kick after a handball in the first half, but she feels the Bulldogs are working their way up to their peak performance that can lead McHi back to the state tourney for the second consecutive season. Even though the Bulldogs put up six goals during their opening playoff game, Arney has his team chasing a different six. McAllen High awaits the winner of Edinburg Vela and Brownsville Hanna in the area round.